Like many things these days, I learned about Navajo-Churro sheep through social media: I befriended a woman named Jessica Carhart, who has a small flock of her own at her Seven Bridges Road Ranch in Bend, Oregon. She told me about the breed and their history, which she had initially learned about through a Fibershed event in California. Jessica raises Churro sheep as part of a conservation effort around the breed, so she educated me on the history of the breed and their essential role in Navajo culture. Churro sheep were brought here by Spanish settlers and were the first domesticated sheep on this continent. Through trading and raiding, the Diné (Navajo people) began to keep the sheep and over many years, they developed a new phenotype, the breed now known as Navajo-Churro. 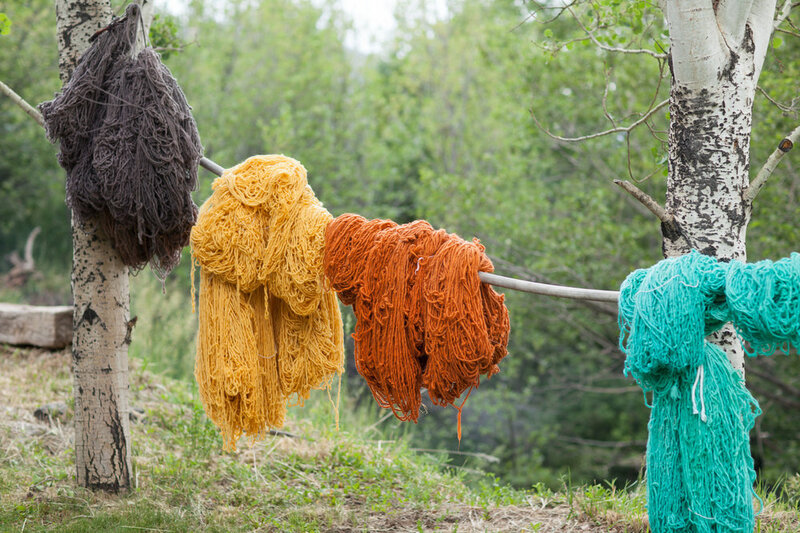 With a beautiful luster, a wide variety of natural colors (reds, browns, blacks, creams), and great durability, the fiber is perfect for Navajo staples like rugs and saddle blankets. The animals themselves are very low maintenance, resistant to disease, adaptable to extreme climates and their meat is considered to be superior tasting, although the breed is primarily used for wool. The sheep occupy a place of major cultural significance for the Diné people; the phrase “Sheep is Life” serves as a defining motto. In 1865, the Diné were forced on a 300-mile, 18-day journey on foot, known as The Long Walk. Many Diné died and a considerable amount of livestock, including Churro, were killed. After several years, the Navajo were allowed back to their land, and then they were able to increase their sheep numbers. Then, in the 1930s, the Navajo-Churro faced another unfortunate reduction. Due to the drought, the U.S. government imposed the slaughter of sheep, goats and horses in all households, threatening the breed with extinction. It’s a fragile balance to navigate, but Navajo-Churro fiber does seem to be gaining a wider audience. And despite farmer’s different reasons for raising them, Nikyle says, “I like to call them a truly all-American breed.”I spoke to Kelli Dunaj of Spring Coyote Ranch on the central coast of California. She and her husband both formerly worked in corporate settings in the San Francisco and about four years ago, they bought a 200-acre coastal ranch in Point Reyes. Kelli chose to raise Churro sheep for a number of reasons, but the uniqueness of the breed is what sticks. “I'm crazy about them,” she told me, “They’re so beautiful, they're so smart and they're so wise.” No matter who I ended up speaking to for this story—whether new to the breed, or to farming, or descending from a long line of Navajo-Churro husbandry—everyone seems compelled by a common passion for their preservation and a feeling of stewardship for the animal. For more information on Navajo-Churro, visit navajo-churrosheep.com.